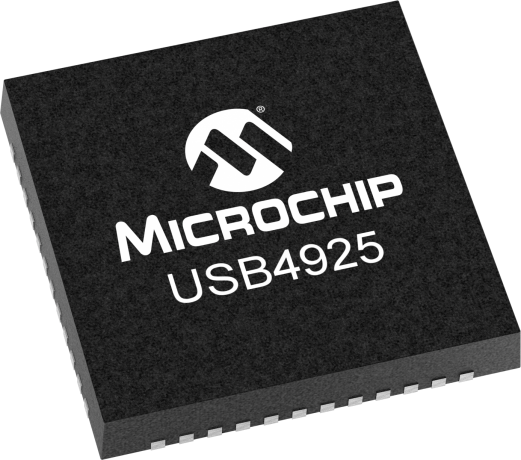 The Microchip USB4925 is a USB2.0 Hi-Speed Hub with unique Smart Hub features targeted to automotive consumer ports and head unit applications. The USB4925 is compliant with the USB 2.0 Specification and has passed AEC-Q100 testing. This highly integrated chip optimizes board area and reduces overall system costs, with the incorporation of leadership functionality, including; Dual UpSTream (DUST) architecture, battery charging support for industry profiles, embedded 32 bit micro-controller for the implementation of USB IO bridging and USB Power Delivery. The multiple downstream USB ports support USB2.0 Low Speed/Full Speed/Hi-Speed with a single USB2.0 Hi-Speed upstream port for host connection. The Dual UpSTream architecture incorporates two USB Hubs into a single-chip device. The two upstream ports connect to a USB Host Port and a USB OTG/Device port. Two of the downstream facing ports can be dynamically configured to the second, single-port USB hub, while the third downstream, non-removable port is always connected to the Upstream USB Host. The non-removable port is targeted for cascading hubs or to connect a USB peripheral, such as a card reader. By providing the capability to activate a second USB network through internal muxing, dedicated bandwidth is assured for the second USB network. This capability can be used in delivering solutions for smart phones that require host / device swapping during the set-up of an automotive session,where the mobile device becomes the USB Host and manages the graphic user interface on the head unit display. Standard USB drivers, which are native to the operating system, are utilized to execute device operation. No custom drivers are required. . Contact your Microchip local sales support for information on support documents, demonstration application boards, configuration software, datasheet and application notes.